The fires and explosions at Fukushima Daiichi nuclear plant have prompted a massive increase in the sale of anti-radiation tablets in the US and Canada – despite health officials and a prominent UK scientist dismissing it as unnecessary. 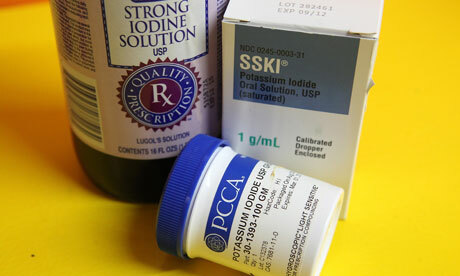 Companies in North America have reported selling out of potassium iodide supplements, which can prevent the body absorbing radioactive iodine, while in the UK one chemical manufacturer has reported a "surge" in inquiries about the chemical. Medical authorities in California have warned against taking the drug, which can cause side effects. But that has not prevented nukepills.com from receiving "a new order every 30 seconds". "We are quite slammed with orders, but we are working as fast as we can to get orders out. Our phones are swamped, so please do not try to call," the US website advises. On Sunday the company tweeted: "Over 3,800 orders in 18 hours. Wow", and has since updated about its efforts to donate 50,000 potassium iodide tablets to Japan. The following day, nukepills.com was back on Twitter to report it was receiving a new order every 30 seconds, later adding that although it was out of stock of the drug, more was being shipped in. Similarly, fellow US company iHerb.com had sold out of liquid and tablet potassium iodide at the time of writing, while the UK chemical manufacturer ReAgent has received a marked increase in calls regarding the tablets – although most UK calls have been inquiries about obtaining potassium iodide for relatives or employees in Japan. Professor Gerry Thomas, chair in molecular pathology at Imperial College London, said the increase in sales was mostly due to irresponsible reporting. "If they [people in the US] are buying [potassium iodide] to protect themselves from radiation – what radiation?" she said. "This has been so massively overhyped by the media it's unbelievable." Thomas said radiation released from Fukushima posed no threat to people in the US or the UK. "I can understand them being scared, but radiation isn't scary. It's people's perception of radiation that scares them." The professor said the only people at risk of radiation poisoning at Fukushima were the workers at the plant. "In the immediate vicinity of the reactor, where the workers are, it's a danger, but as you move away the danger drops massively." The US energy secretary, Steven Chu, told Reuters he did not think it was necessary to buy the supplements, while Californian officials advised against purchasing potassium iodide as it works only for those close to a "nuclear event" and could be dangerous to people with allergies to shellfish or with thyroid problems. Cheshire-based ReAgent tops the rankings on a UK Google search for potassium iodide, and although the company does not sell the drug in tablet form – stocking it only in industrial quantities – the company's operations director said it had experienced a "surge" in calls. Darren Wilson said: "We've had about 40 inquiries over the last couple of days. That's a lot considering we wouldn't normally get any inquiries for that product." He added that most queries were regarding purchasing potassium iodide for people in Japan, with one call from a media organisation with staff reporting from the country.